I suppose the mountain-climbing analogy makes sense — climbing mountains is hard. 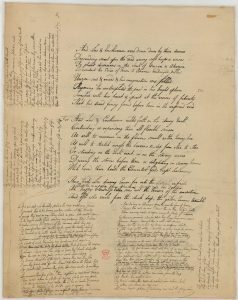 For anyone with even a fleeting familiarity with this particular Blake manuscript, the difficulty of the Four Zoas is readily apparent. Reading it is hard. Editing it is, perhaps, futile. But we try. And even in our failures do we learn. We’ve written about our Four Zoas work in a variety of contexts, and the topic has been represented well on the blog. At the close of another academic year, we’ve made progress. Most importantly, we have but one item left on our digital-edition checklist: line numbers. 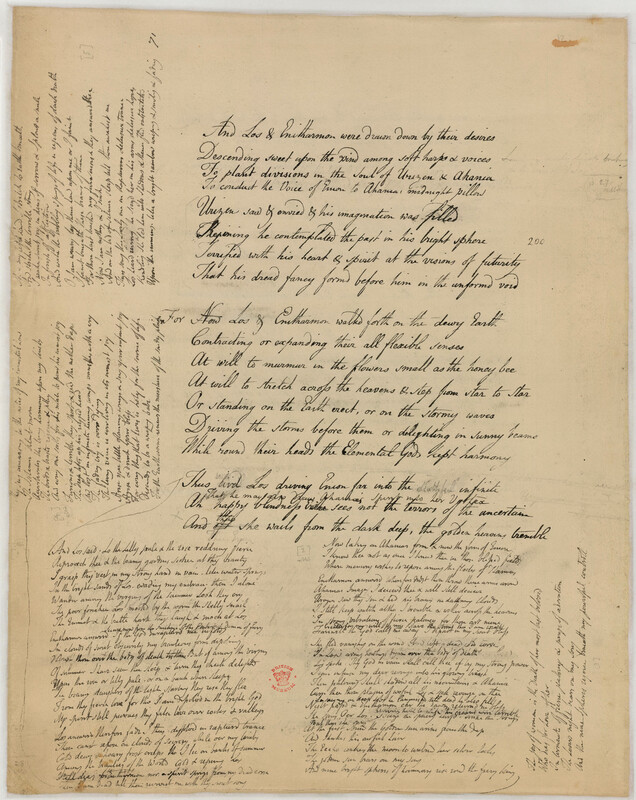 The scheme essentially creates a unique ID for each line in the Archive — contributing to a powerful search function and enabling a high degree of specificity in citing and using the Archive. So we have a few problems. First, following our use of <zone> to encode discrete segments of text, how should we number these lines? Do we start over at “Line 1” for each zone? In an object like the one above, that means we might have three or four line 1’s at once. Is that useful or confusing? Second, even if we want to create multiple line 1’s, how will that affect the attribute system? We’ll not only have multiple line 1’s but multiple “n=” values in an XML document. Questions for now, answers [hopefully] soon. This encoding conundrum, however, is the last for our digital edition. Then it’s only 145 objects to encode and an interactive transcription display to develop. OK, so maybe we’re glimpsing the summit through a good set of binoculars.